We’re big fans of multiple purpose tool systems. They save space in toolboxes and storage cabinets, are easier to tote around, and are generally less expensive than buying the individual tools they duplicate. The only potential drawback to tool systems is that they sometimes fail to perform as well as a single purpose tool for the same job. This happens because trades have to be made in the design to accommodate all of the different attachments and hand motions the tool might need to perform. Earlier this year, Ridgid released the JobMax 12v Li-Ion System into the competitive market of small cordless tools. The JobMax is designed to replace five traditional tools: (1) a right angle drill; (2) an oscillating tool (also called a “multi-tool” itself); (3) an automatic hammer; (4) an impact driver; and, (5) a 3/8″ ratchet. The JobMax comprises a relatively straightforward design. The body of the tool houses an electric, variable speed 12V motor, ergonomic trigger, and forward/reverse switch. On one end of the body, a rechargeable 12V lithium ion battery snaps into place. On the other, one of five heads connects to a tool-free quick connect interface. The heads can be oriented into 4 positions, each spaced 90 degrees apart to allow for flexibility in the orientation of your hand vs. the work target. Ridgid provided us a test kit of the JobMax System that included the oscillating multi-tool head and the ratchet head. Our review is limited to these two tools. For a review of all five attachments, Popular Mechanics compares the JobMax tool (favorably) to many of the single purpose tools it competes with. Our findings are similar to theirs. We think Ridgid has created a solid multiple purpose tool in this crowded competitive space. Read on for our full review. 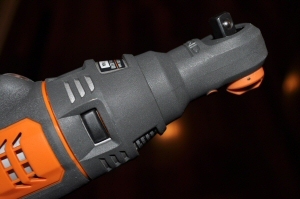 The Highs: Good as both a ratchet and oscillating tool; excellent ergonomics; very solid feel and good weight; variable speed motor & trigger; tool-free quick connect interface for changing heads; LED light; organized carrying case. The Lows: No plug-in option; no trigger lock-on; multi-tool vibrates a bit more than our plug-in versions under the same application. 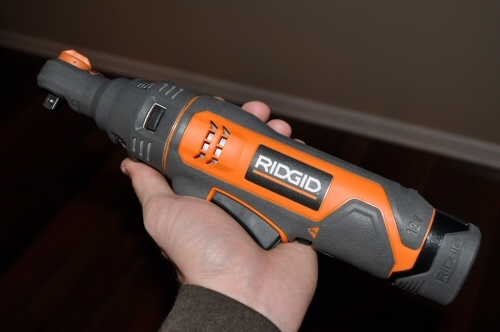 The Verdict: Ridgid delivers very solid value in the JobMax. We recommend it. Ergonomics: The first thing you’ll notice about the JobMax as you unpack the tool from its box is its excellent weight and balance. Snap the 12 volt battery in one end and put the oscillating tool on the other, and the tool is perfectly weighted with a center of gravity near the front of the trigger. This weighting inspires confidence, making it easy to direct the business end of the JobMax right where you want it. The weight and balance are complemented by the no-slip surface that makes the Ridgid feel like its glued to your hand… in a good way. Competitors could take a lesson in ergonomics from this tool… The grip is every bit as nice as the Bosch Jigsaw we tested two weeks ago. The trigger on the JobMax is excellent. Power increases steadily through the travel and it is easy to set and hold a certain power level. Resistance seems to be just right. The tool doesn’t accidentally turn on while you’re holding it, yet it won’t fatigue your trigger finger after hours of use. Oscillating Tool: We used the oscillating tool to make cuts deep into dimensional 2×4 lumber (it was readily available for our test). This is the third oscillating multi-tool we’ve tested this year (the other two were the Sonicrafter and the Multimax, both corded models). The Ridgid performed as well as both of these powered models. A notable difference, though, is how the Ridgid controls speed. On the Sonicrafter and Multimax, you set the speed using a dial, which allows for a very deliberate choice. On the Ridgid, you must control the speed with the trigger. It’s fairly easy to hold a selected speed, but unlike the competition, you can’t precisely duplicate a cutting speed based on a cutting recommendation from a manufacturer or expert. Also, on the Ridgid, you must keep the trigger pulled, whereas the Sonicrafter and MultiMax have a set on/off switch. About the only performance difference we noticed between the Ridgid and the corded competition was slightly higher vibration from the Ridgid. This is likely due to the quick connect drive shaft the Ridgid needs to facilitate interchangeable heads. This wouldn’t be a show stopper for us as it wasn’t extreme, but it might be an annoyance for a woodworker who uses a multi-tool on a regular basis. The oscillating tool head comes with a variety of cutting and sanding blades, similar to what ships with competitor products. You change the blade with an included hexagonal key. It would be great if this key could be permanently attached to the tool or tool head, since all of the JobMax kits include the oscillating tool standard. Ratchet Tool: The ratchet tool works just as advertised. We were surprised at how muted the vibration is compared to the oscillating tool. The ratchet provides up to 250 in. lbs. of torque (about 21 ft. lbs). It’s no replacement for an impact wrench or even a manual ratchet, but it will work for many common assembly/disassembly tasks. For places where you need the bolt tighter, this could take the arm work out of most of the tightening before you switch to a manual ratchet. The ratchet includes a 3/8″ to 1/2″ adapter so it can be used with 1/2″ sockets. Batteries & Charging System: Batteries are 12V, 17 watt-hour and quick-charge in 30 minutes (a nice plus). Only one battery is included in the starter kit for the JobMax. You can purchase additional batteries (and we think one more makes a lot of sense, so you can charge while you work). 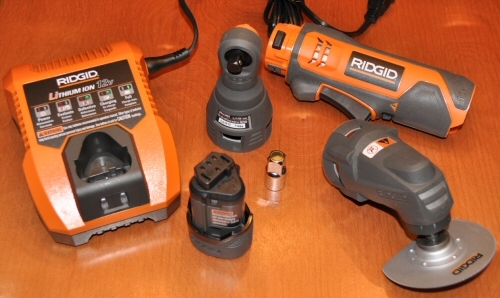 Battery life is on par with the competition in the 12V space – especially with the tools that Ridgid competes with. We’re still yearning for the battery that lasts the whole work day, though. Extras: All of the JobMax starter kits come with a deluxe carrying tote. We prefer soft-side totes as opposed to molded plastic because they are easier to carry and take up less space. The only limitation of this tote is that if you happen to own all 5 attachments for the JobMax, they won’t have individual storage straps (you’ll end up just throwing them all in the bag). 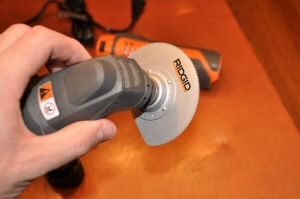 After using this tool on a few tasks, we really think Ridgid has a winner. This would make a great gift for the holidays or really any occasion. Ridgid woodworkers tools are sold exclusively at Home Depot. Starter combo kits begin at $99.00 and include the oscillating tool head and one other head (any of the 4) with a battery and charger station. You can also purchase the JobMax with the oscillating tool head and a separate Ridgid 12 volt lithium ion drill driver that takes the same battery. This package costs $159.00. The bonus with this kit is you get an extra battery. Unfortunately, you don’t get the extra head. JobMax heads are $50.00 each. We just bought this and we love it. We couldn’t have installed the rafters of our house without it. I purchased a new Ridgid Jobmax, extra battery, and all accessories in August 2010. I loved this tool. Then in September it quit working. Ridgid instructed me to send it to my nearest repair facility. After a month I call the repair center and they told me they were waiting on a replacement switch assembly. I contacted Ridgid and they told me the switch assembly would not be available until January 2011. I will be without this tool for over three months and Ridgid was not willing to send me a replacement. That is the last Ridgid tool I will ever buy. Yea my dad has one, it really is a great tool. I got one early in december to help put up and build our Christmas scenery for our church program and also for some work around home and our Summer Camp. I love it but have started to have some problems with the trigger assembly. It only happens when I am about 3/4 of the way through the charge so I hope it is fixable. I really appreciate this tool and all I can do with it. It would be a shame if I have to return it and have to go with something else. I will give it a couple more weeks of use and then see if the problem gets worse. I am also fan of the multiple purpose tools system. That is because I am not a professional using tools so when I need them is to fix something at the house. These kits are so useful and cover almost all your needs. Unfortunately I may have purchased my last Ridgid tool. I am a woodworking hobbiest and own a lot of tools. I was in the proccess of converting my entire shop to Ridgid products as it became time to add a new tool or replace a worn one. I have purchased a number of Ridgid tools for myself and as gifts for family members. I purchased the Ridgid Jobmax and began having problems with the switch. The tool would often quit while performing a cut. The same was happening to one of my Ridgid drillls. I brought the tools to a Ridgid repair depot and was told it would take a week to repair. That was 10 weeks ago and still no sign of my tools. Parts still back ordered they say. This is very inconvenient since I am in the middle of a huge reno of my home and need my tools for specific tasks. What is most frustating though is the attitude of Ridgid. I emailed them and asked when I could expect to have the parts and their response was a cold “sorry, parts are on back order.” end of story !. To make matters worse Home Depot here agreed this was unacceptable and advised me to call the local Ridgid rep. They provided his phone number. I called and a recording said he would call me back same day. That was 10 days ago. Still no call. I’m think I may be done with Ridgid as will be most of my friends and family if Ridgid doesn’t soon show they actually value their customers.